The current market capitalisation (m-cap) of Indian equities is around $2.09 trillion, making it the seventh largest market by size. M-cap, which is the market value of listed firms, typically moves in tandem with economic growth. India is the fastest growing major economy and its gross domestic product (GDP) is likely to touch $5 trillion by 2025, which will reflect in the performance of its stock markets. India’s m-cap has room for improvement as its m-cap-to-GDP ratio, at around 78 percent, is below the world average and also much below its historical peak of 151 percent seen before the global financial crisis in 2008. Brokerage Morgan Stanley says the m-cap of Indian equities is likely to hit $6.7 trillion by 2027. Active management or passive funds? This presents an exciting long-term investment opportunity. Some ways to capitalise on this opportunity are direct investment in equities and actively managed equity mutual funds. However, many actively managed mutual fund (MF) schemes have underperformed, i.e. generated returns less than the benchmark (Nifty) in CY18. This makes us ponder: is it time for Indian investors to look at passive funds? Yes, it is — since it is getting increasingly difficult to out-think the market, investors should aim to at least match the performance of the market (index) as a whole. That can be achieved by following a passive investing strategy, which aims to mimic the index performance as against active managers who try to beat the index return. The advantages of passive investing are well-known. The approach spreads risk widely within a market, avoiding the losses that can follow a dramatic decline in any one specific company or sector. Moreover, it is very simple to implement and is cost effective. Passive investing can be pursued either by investing in ETFs (exchange traded funds) or index mutual funds. Although the underlying portfolio of an index fund and ETF is the same, their structure is completely different. Index funds are open-ended mutual fund schemes that invest money in the same weightage and companies that comprise the index. ETFs trade like a stock and investors can buy units only from an exchange. ETFs are a far better way of replicating an index as they have lower expenses than index funds. Also, ETFs mimic the performance of the index more closely (this is technically termed as lower tracking error). After selecting a suitable investment vehicle (ETF or index funds), the dilemma often faced by passive investors is selecting the most appropriate index. 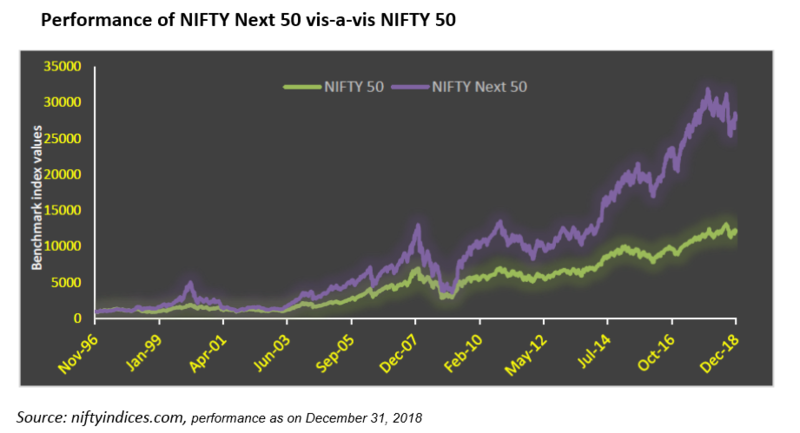 While Nifty is the most popular index, investors should consider the Nifty Next 50 (Nifty junior) index instead, as it does far better than the Nifty in terms of diversification and performance. Let’s look at a comparative analysis. 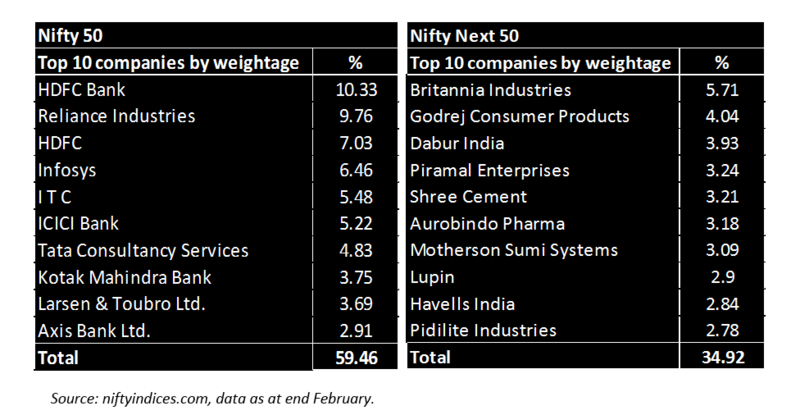 Nifty Next 50 index consists of 50 emerging companies that ‘aspire’ to be a part of the coveted league of Nifty stocks. These companies are currently below Nifty index companies in terms of m-cap (free float), but may be potential candidates for inclusion in the Nifty in future. Over the last 18 years, a total of 41 stocks have been upgraded to Nifty. Out of these 41 stocks (the likes of Kotak Mahindra Bank, Axis Bank, Bajaj Finance, Titan, Eicher Motors, etc) which were upgraded to the Nifty, 27 stocks still form part of Nifty and weighs about 28 percent of its portfolio as on December 31, 2018. The Nifty Next 50 index has 14 sectors with 11 sectors having individual weights lower than 10 percent each. The top three sectors account for 59 percent exposure, while for the Nifty, the top three account for 67 percent of the index. This makes Nifty next 50 a well-diversified index from a sectoral perspective. Financials services have the highest weightage in the Nifty (around 37 percent), while consumer goods is the largest sector in Nifty Next 50 with a weightage of around 28 percent. It is worth noting that while financial services is the second largest sector in the Nifty Next 50 index, the sector representation is wide including insurance companies. Moreover, an asset management company (HDFC AMC) is slated to enter Nifty Next 50 following the proposed changes that are slated to happen from March 29. 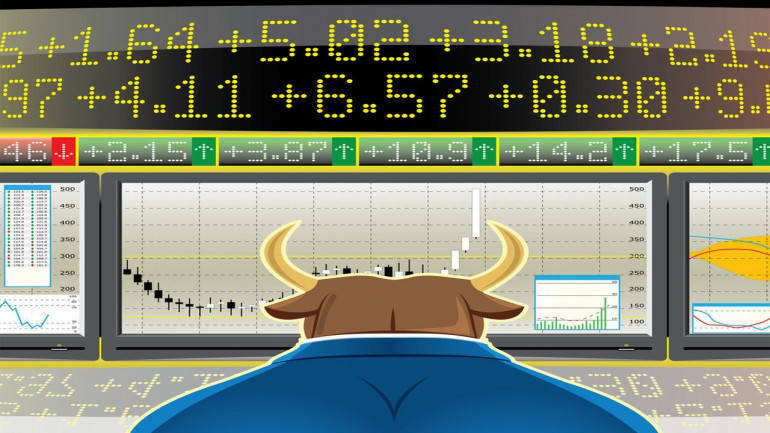 At the stock level also, Nifty Next 50 boasts of a well-distributed portfolio, with the top 10 stocks contributing close to 35 percent exposure with individual stock weights ranging between 3 percent and 6 percent. On the other hand, the Nifty is relatively concentrated, with the top 10 stocks having a combined weightage of around 59 percent, with the weight of a couple of individual stocks at 10 percent. Since its inception in November 1996, the Nifty Next 50 index has delivered an annualised return of 16.3 percent as compared to 12 percent for the Nifty, a substantial excess return of 4.3 percent per annum. 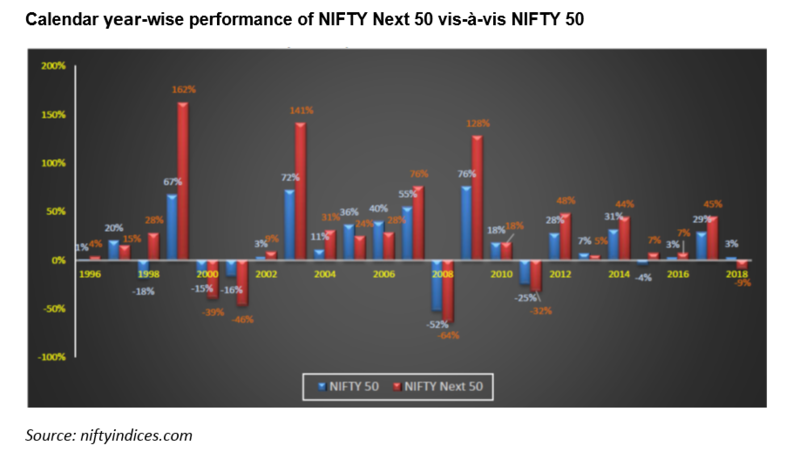 Nifty Next 50 has outperformed Nifty over all longer periods (three, five, seven and 10 years). CY18 was an exception where Nifty Next 50 underperformed the Nifty. While the returns of Nifty Next 50 have been impressive, the volatility or risk (technically known as standard deviation of returns) has been only marginally higher as compared to that of the Nifty, making the return-to-risk ratio for the Nifty Next 50 considerably better than that of the Nifty — at least for periods longer than three years. With elections around the corner, political events will continue to fuel volatility. But it would also lead to an opening up of opportunities in the market which should be capitalised by long-term investors. We suggest investors should focus on the fundamental picture, which is like a compass showing the right direction amid all the political noise. On a fundamental valuation basis, the Nifty Next 50 index looks relatively expensive. But the high price-to-earnings (P/E) and price-to-book (P/B) multiple of the Nifty Next 50 index is an optical illusion and can be attributed to the highest weight to consumer goods sector. The consumer goods companies which typically trade at high P/E multiple are pushing the overall valuation of Nifty Next 50 upwards. However, Nifty Next 50 has significantly underperformed the Nifty in CY18 and therefore the valuations of Nifty Next 50 companies have moderated.